There are few pleasures greater in life than getting a lovely crunchy biscuit on the side of your coffee. (Ok, there may be a few greater pleasures!). We commonly call them biscotti, but they are also known as cantuccini. I believe that the latter means coffee bread while the former refers to biscuits that would have traditionally been baked twice. I know that some people don’t enjoy this type of biscuit, citing it as too hard but I think dipped in coffee, that the nuts and crunch are really delicious. I chose chopped hazelnuts and walnuts for this recipe because I quite like to have little bits of nut distributed throughout the biscuit, as well as the lovely whole chunks of walnut. Biscotti/Cantuccini are naturally lactose free as they don’t contain any fat. Wherever possible if I need to cook without a certain ingredient, I like to find recipes that wouldn’t have contained them anyway. It makes life simpler and also means that your recipe is far more likely to work out. 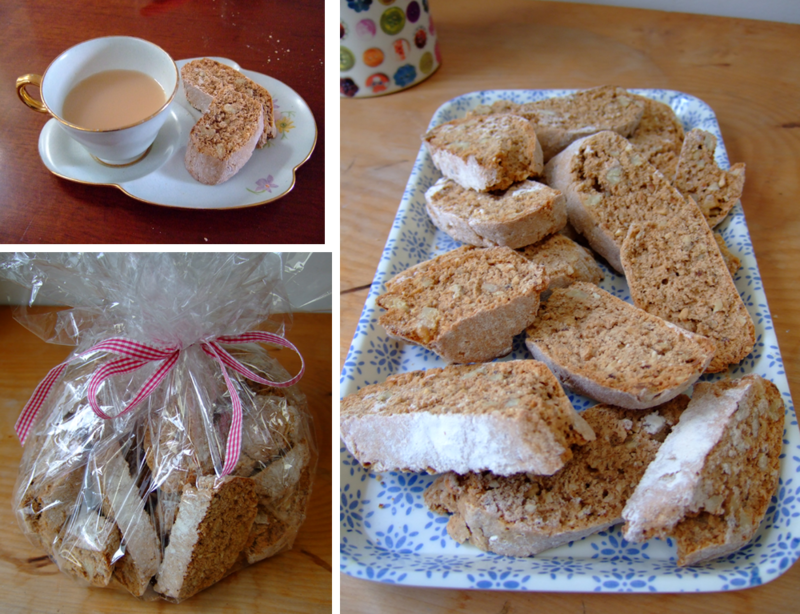 On this occasion, these crunchy biscuits were an offering for my friends who had just had a beautiful baby girl. By my reckoning, the new parents definitely deserve a gift and this seemed fitting. Friends and family gather when there is a new arrival and it is nice for the new parents to have homemade biscuits that store well to offer any visitors. It also gives them a snack for the caffeinated drinks that might well fuel their existence for a few months. Mix the eggs, vanilla essence and orange zest in a small bowl. Mix the dry ingredients and the nuts in a large bowl. Stir the wet ingredients into the dry. The dough will be quite sticky. I used a mixer but this can easily be done by hand. Using a floured surface and floured hands, shape the biscotti into two log shapes. Place on a floured baking tray and bake for about forty five minutes. This is the first of two trips to the oven. Let the logs cool on an oven rack for about ten minutes to make them easier to slice. I floured my baking tin but baking parchment would probably be a better idea. Use a serrated knife to cut the logs diagonally into ½ inch to one inch thick slices. When slicing them, use a sawing motion with the serrated knife. Lay the sliced biscuits on the baking tray and bake again for 20 to 30 minutes. I like mine to be golden around the edges without being too dried out, so I left mine in for about twenty minutes. Stored in an airtight container, these will keep for several weeks. This amount makes between 24 and 35 biscuits. If you’re interested in lactose free recipes, why not try out Almond Peanut butter Cookies. For other biscuit options, try Hazelnut Shortbread with a chocolate filling or Almond and Raspberry Jammie Dodgers. , edible gift, Hazelnut, orange, walnut. Dairy free-deadly! I know what I am making this weekend!